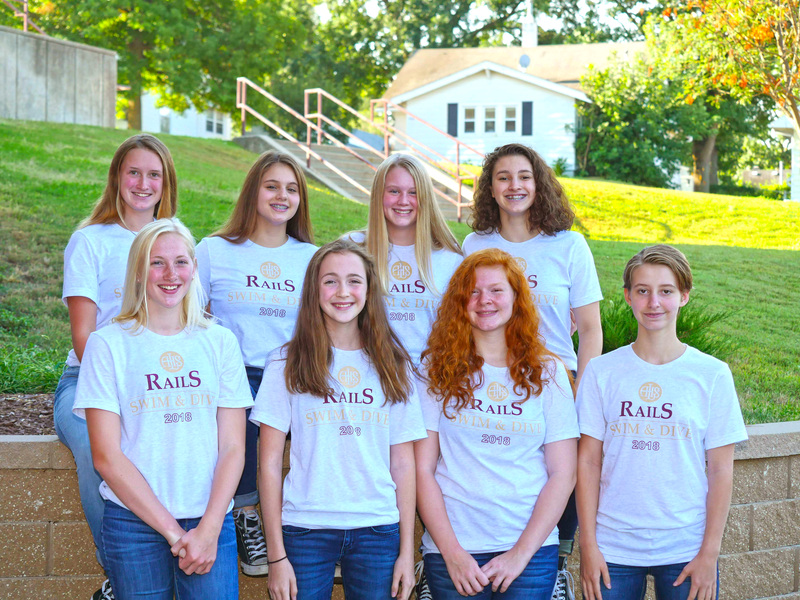 We are very excited to welcome these 9th graders to the Rails Swim/Dive team! These young ladies are the building blocks for the future, but their contributions this season shouldn’t be overlooked. Some have been swimming as part of the Rails feeder program, South DM Swimming, since they were six years old! Learn a little more about each girl below. Mallory Albright | Mallory attends Norwalk High School and competes in the 50 Free, 100 Free and diving. Her goals for the 2018 season include becoming consistent in her 50 Free, get Sub :60 and master the first six dives. She’s most looking forward to the team dinners, making new friends, reaching personal bests and winning meets. Mallory is also involved in show choir, marching band, choir, band and cheerleading. Lauren Benson | Lauren attends Lincoln High School. She swims the 100 Fly and 100 Free. Her goal times include swimming a 1:02 100 Fly and being consistently Sub :60 in the 100 Free. She’s excited about spending time with the team and making school history. Lauren is also involved in soccer. Ripley Berg | Ripley attends Lincoln High School. She swims all four individual freestyle events (50 Free, 200 Free and 500 Free) depending on the meet. Ripley is most looking forward to reaching new personal bests, spending time with friends and the Thursday Morning Breakfast Club. She’s also involved in track. Aubrey Douds | Aubrey attends is a Lincoln High School. Her main events for the 2018 season are the 50 Free and 100 Free. Her goals for this season are to improve her times and qualify for the state meet. Aubrey is excited for the team bonding and to reach new personal bests in the water. She also involved in marching band and JROTC. Hannah Groos | Hannah is a freshman at Norwalk High School. She competes in the 100 Free and 100 Back. She has set a final goal time for her 100 Back of 1:04 and aims to have a season-average of 1:07 or 1:08. Hannah is looking forward to the full high school swim experience, including winning meets, making school history, reaching personal bests and team bonding. She’s involved in basketball, track, jazz bands, marching band, bad, student council, robotics and Girls Who Code. Brianna Neifert | Brianna attends Norwalk High School. She competes in the 50 Free and 100 Back. Brianna’s goals this season include seeing a an improvement in her swimming technique and dropping time while she improves. She’s most looking forward winning meets, making school history and reaching new personal bests. She’s also involved in marching band. Jordan Toelle | Jordan attends Lincoln High School. She swims the 50 Free and 100 Free. Her goals for 2018 are to better herself and get faster. She’s most excited about reaching new personal bests, team bonding, spending time with friends and making new friends. Jordan is also involved in drama, (and hopes to have a part in the play) and the art club.